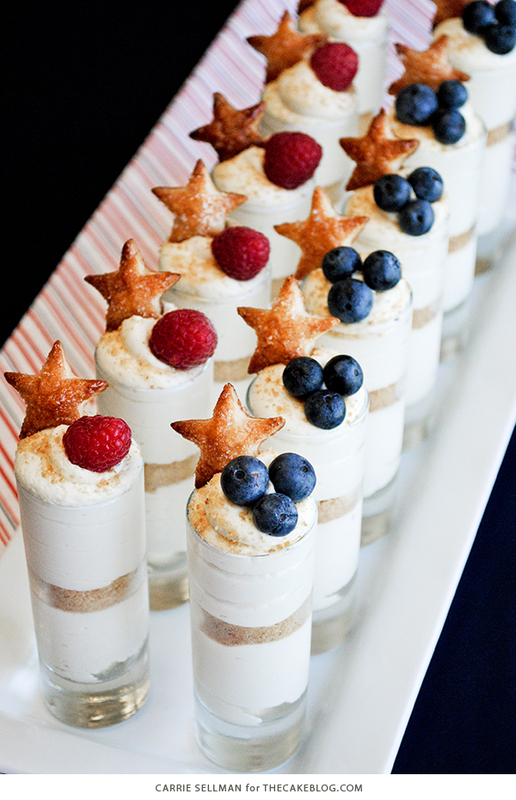 Stars and Stripes Cheesecake Shots. No-bake cheesecake filling layered with graham cracker crumbs, topped with fresh berries and puff pastry stars for a patriotic 4th of July dessert. With the 4th of July holiday right around the corner, we’re gearing up for some fun with these easy no-bake cheesecakes. Mini dessert glasses are filled with creamy cheesecake filling and layered with graham cracker crumbs and then topped with berries. These little treats have become a staple at our family events over the last year. To give it an extra special touch for the 4th of July, I added small puff pastry stars. 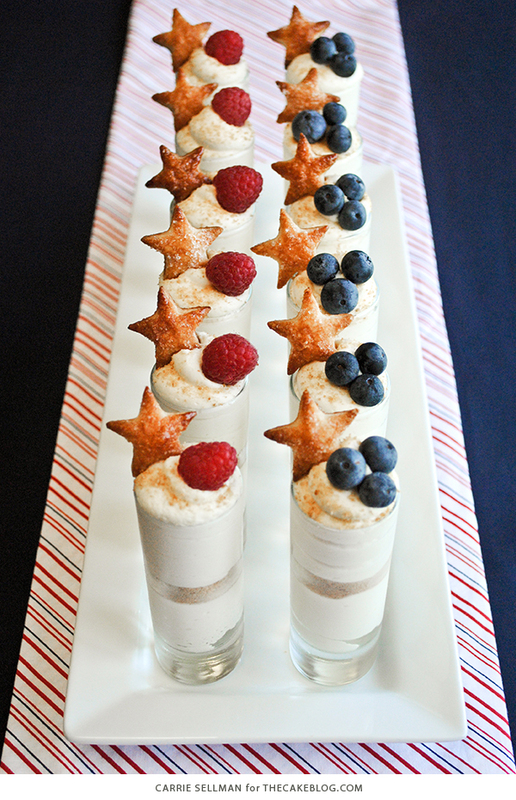 No-bake cheesecake filling layered with graham cracker crumbs, topped with fresh berries and puff pastry stars for a patriotic 4th of July dessert. Fill mini dessert glasses half way with cream cheese mixture, either using a spoon or a piping bag fitted with a large round tip for a more polished presentation. Top with 1 tsp graham cracker crumbs. Shake glass to level crumbs. Fill to the top with more of the cream cheese mixture. Lightly sprinkle with additional graham cracker crumbs and top with berries. Add a star pastry for an extra fun little touch. Refrigerate 4 hours or until firm. Serve chilled. Makes roughly 16 mini servings, depending on the size of your serving glass. Use a Ziploc bag to fill glasses if you don’t have a piping bag. Just fill it partially, seal and snip off one corner. Squeeze out! Set out cream cheese ahead of time so that it comes to room temperature. This will help everything blend together and create a smooth consistency. 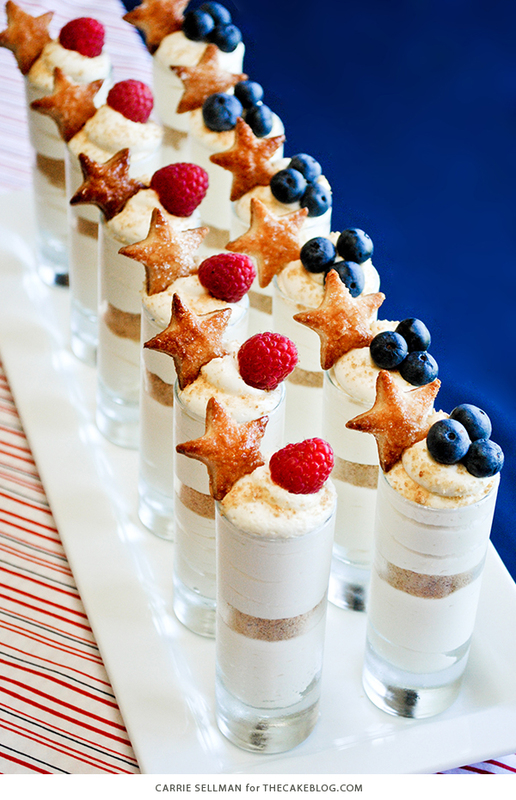 Serve with a bowl of berries and additional Star Pastries for a patriotic display. This looks amazing, thank you for sharing. LOVE the addition of the puff pastry stars! How adorable are those?? Love the presentation! How did you make the pastry puffs? Oh, these are just SO adorable … I could almost eat the photo! I tried these for the fourth, so delicious and so easy! Thank you! They were a big hit! Glad to hear that Katie! Where do you get the shot glasses a about what size Are they? They are Libbey mini dessert glasses and they’re about 2.5 oz. Hello! 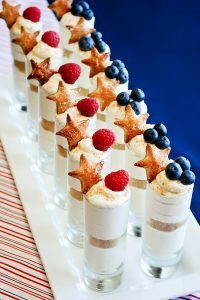 These are so beautiful, and I’m planning to make them for an event I’m hosting this week for some fellow Army spouses. Any tips on making these ahead of time? Would it be ok to make them the night before? If I do, should I wait to pop the berries and stars on until shortly before serving or will the cream cheese mixture be too firm to get the stars and berries to stick? Any thoughts would be helpful! Thanks! 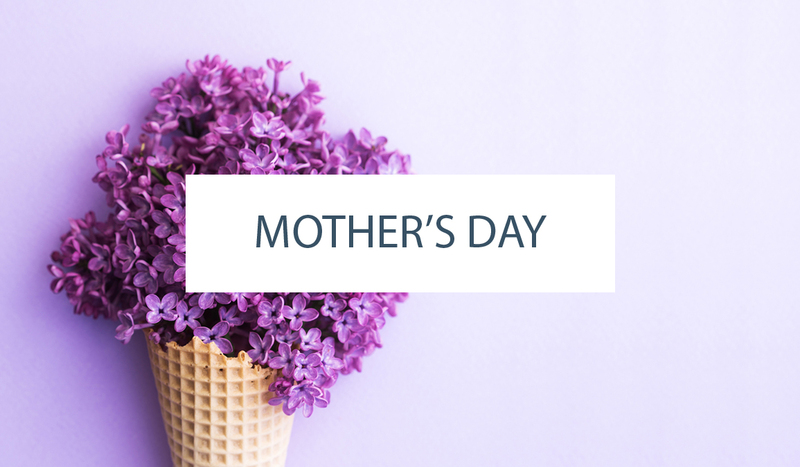 The cheesecake and the berries will be fine if you make them one day in advance and store it in the refrigerator. The pastry stars might get a little chewy but they’ll still be good. You will need to assemble everything while the cheesecake mixture is still soft, so that it all sticks together. Alternatively, you could serve the pastry stars on the side. Awesome tasty and easy in prosses. This recipe looks very simple and delicious. I love the cheesecake and the idea of serving it in glasses is adorable. The presentation is also fantastic!